Mark Twain once said, or at least is supposed to have said: “A lie can travel halfway around the world while the truth is putting on its shoes.” The climate change contrarian blogosphere that has recently emerged is rather like that. Every month, there is some new argument being passed around that “disproves” global warming or the integrity of climate science in general, and it is amplified in blogs and opinion columns worldwide. These global-warming-disproved memes seem to have had something of a revival recently, which is ironic considering that the scientific evidence, if anything, has moved in the opposite direction: the evidence for global warming is now stronger, and more alarming, than ever. This will be the first in a series of posts on the arguments contrarians make against global warming. Claim: The Earth isn’t warming. Fact: The Earth’s surface has warmed about 0.72°C in the last century, and about 0.18°C/decade in the last quarter-century. * Before the 1970s, the trend was much slower and disguised by large fluctuations, including a slight cooling in the mid-20th century (which I’ll discuss in a future post). The oceans are warming, and so is every continent. Claim: The temperature record is unreliable. Fact: There are four main surface temperature records: the 130-year records of NOAA’s National Climatic Data Center (NCDC) and NASA’s Goddard Institute for Space Studies (GISS), the 160-year record of the University of East Anglia’s Climatic Research Unit (CRU), and the lesser-known 120 119-year record of the Japan Meteorological Agency (JMA). 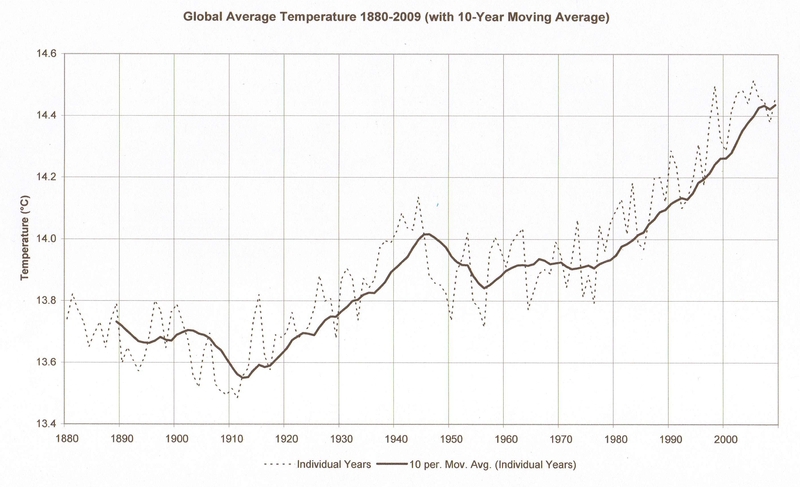 All of these temperature records show similar trends over the past century, although the exact numbers vary. GISS shows more global warming over the last decade than CRU. Most likely, the CRU analysis underestimates warming because it does not fully include the Arctic, where the most rapid warming has occurred; whereas the GISS record is truly global. The record of US temperatures has come under particularly close scrutiny from climate contrarians. So far, despite their best efforts, they have turned up very little. For example, in August 2007, amateur Steve McIntyre found a “Y2K” error in GISS data: due to an administrative mistake, after January 2000 GISS had been using unadjusted US temperature data. However, this problem was limited to the contiguous US, and made no significant difference to global temperature trends. But this did not stop contrarians proclaiming that the correction made 1934 the warmest year on record (only true for the US). The “SurfaceStations.org” project led by TV meteorologist Anthony Watts recruits volunteers to inspect US weather stations and rank them by quality. Many turned out to be sited near artificial sources of heat such as air conditioners. In a report published by the libertarian Heartland Institute in March 2009, Watts concluded that 89% of the 865 stations examined failed to meet NOAA’s own requirements. NOAA’s NCDC responded with a preliminary analysis comparing data from 70 stations that Watts identified as “good” or “best”, with the entire dataset of 1,221 stations. The two showed virtually identical trends, suggesting there is no significant bias. More recently, NCDC researchers concluded that unadjusted data from poorly-sited stations actually had a cooling bias, apparently due to changing instruments during the 1980s. However, adjusted data from the two types of stations were in good agreement. Also, one still occasionally hears the claim that warming is not global, but an artifact of the “urban heat island” effect (temperatures in cities are warmer because of industrial activity). This is a real effect, which climate scientists have long accounted for. (Again, this potential bias has received more attention in US temperature measurements, where it turns out to be insignificant. This may be because urban measurements tend to be made in places like parks, away from industrial areas.) 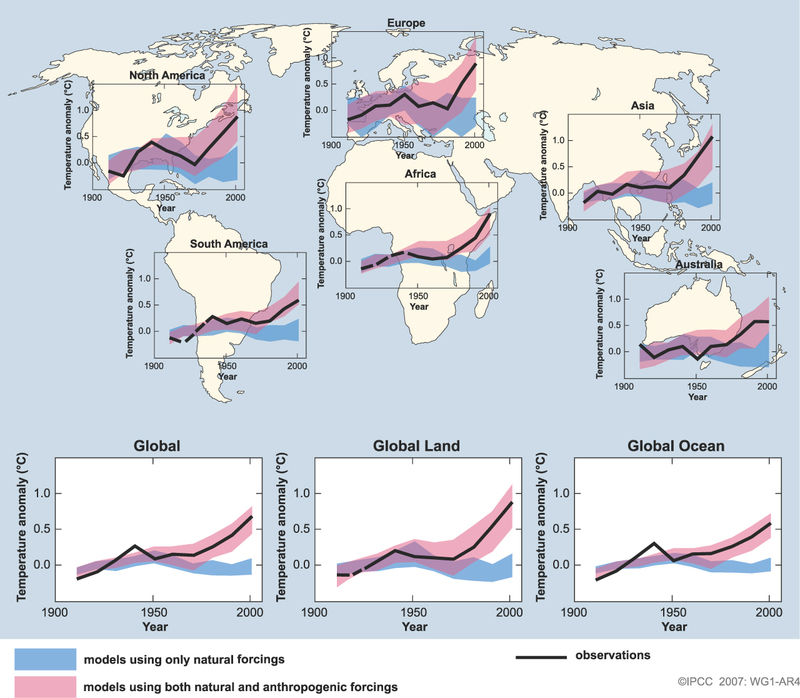 In any case, the rapid warming trends in regions far from cities (eg. the Arctic, Siberia, and the Antarctic Peninsula) cannot be due to an urban warming bias. Claim: We’ve had cold weather lately. Fact: Climate science is not about weather, it is about average weather; and global climate is not about local climate, it is about climate averaged out over the entire Earth. Global warming means that the average global surface temperature is rising. Nevertheless, whenever a particular region experiences a cold snap (incidentally, I am drafting this sentence on a relatively cold day), contrarians are quick to point to this as evidence against global warming. Recently they have been pointing to a cold spell in parts of North America and Eurasia. However, most of them fail to mention that this is part of the Arctic Oscillation (AO), which as of December was in a strong negative phase not seen for decades, moving heat to Arctic regions. Similarly, Australian temperatures are affected by the El Niño Southern Oscillation (ENSO) — but you may not know that ENSO also causes variations in global surface temperatures. I’ll be talking about that in my next post. Also coming up in Part 2: Has global warming stopped? And how much have temperatures varied over the last millennium? *All temperature statistics cited here, unless otherwise stated, I have taken from the National Climatic Data Center (NCDC) record. Update 16 February 2010: The Arctic Oscillation, after returning to a neutral phase in mid-January, is strongly negative again in mid-February – so expect more reports of cold weather in the Northern Hemisphere! Update 9 March 2010: The Arctic Oscillation has again returned to neutral. I like your idea of debunking “myths” & answering specific questions to generate debate, rather than just presenting an argument. Well done.